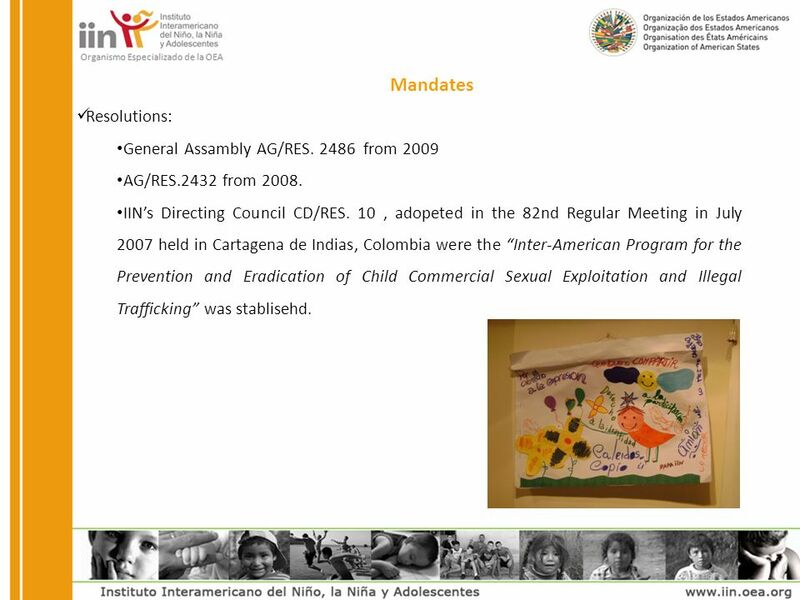 Organismo Especializado de la OEA Report of the Inter-American Childrens Institute to the General Assembly of the Organization of American States on resolution. 4 Member States Adviced: Panama Ecuador Chile Uruguay Colombia Guatemala El Salvador Argentina Venezuela Report to the Secretary General. Containing the efforts on the legislative adequacyl to the international standars, as well as the elaboration and practice of public policies following the international recomendations on the matter. At – distance course on children commercial sexual exploitation. Government and non government operators related to the approach of ESCNNA in their countries, including human trafficking. Identification of good practices and lessons learned in the participating States: Argentina, Colombia, El Salvador, Guatemala, Panama, Peru, Dominican Republic y Uruguay. 5 Achievments Participation on: Second Meeting of National Authorities on Human Trafficking, organized by the Argentin Republic and the Oriental Republic of Uruguay in the framework of the Committee of Hemispherical Security of the Permanent Council of the OAS. Child labor, reality and mediation from a rights perspective Seminar. 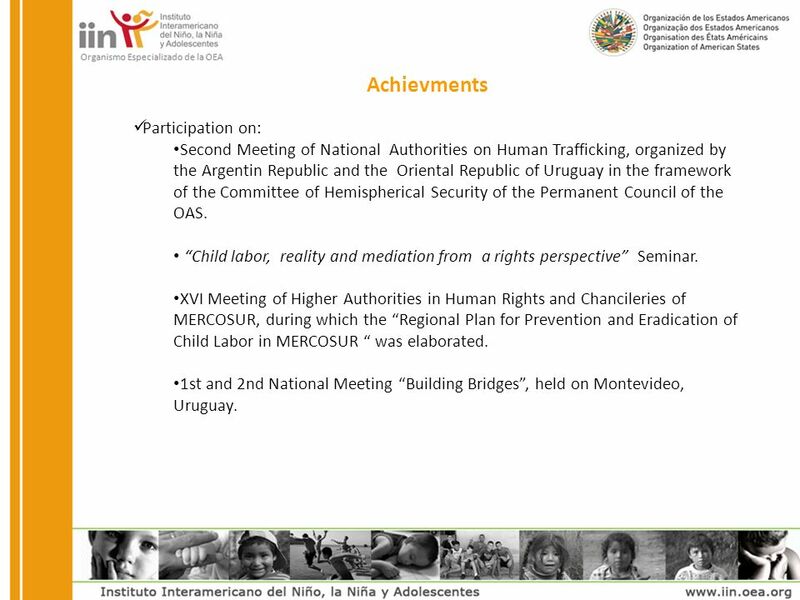 XVI Meeting of Higher Authorities in Human Rights and Chancileries of MERCOSUR, during which the Regional Plan for Prevention and Eradication of Child Labor in MERCOSUR was elaborated. 1st and 2nd National Meeting Building Bridges, held on Montevideo, Uruguay. 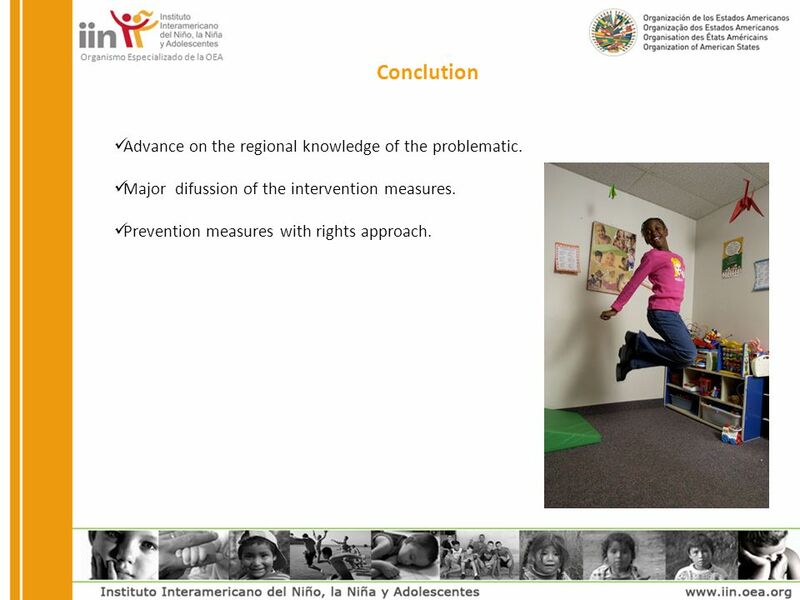 Download ppt "Organismo Especializado de la OEA Report of the Inter-American Childrens Institute to the General Assembly of the Organization of American States on resolution." Migration and Youth: Overcoming Health Challenges Panel 2 Institutional Framework and Multilateral Cooperation: Identifying Achievements and Protection. ANNUAL REPORT INTER-AMERICAN CHILDRENS INSTITUTE GENERAL COMISION OF THE PERMANENT COUNCIL OF THE ORGANIZATION OF AMERICAN STATES. LENORE YAFFEE GARCÍA DIRECTOR OFFICE OF EDUCATION AND CULTURE DEPARTMENT OF HUMAN DEVELOPMENT, EDUCATION AND CULTURE EXECUTIVE SECRETARIAT FOR INTEGRAL. Francisco Pilotti Director, Department of Social Development and Employment Second Meeting of Ministers and High Authorities of Social Development July. Inter-American Security Observatory: Crime and Violence(OIS) Department of Public Security Secretariat for Multidimensional Security General Secretariat. CITEL: Inter-American Telecommunication Commission (Comisión Interamericana de Telecomunicaciones ) International Civil Aviation Organization Spectrum. PIANC USA Latin America Activities David V. Grier Institute for Water Resources PIANC USA Latin America Liaison. Training on Public Security Meeting of Caribbean Academics and Experts on Public Security: Looking ahead towards MISPA III. Twenty-First Pan American Child Congress Twenty-First Pan American Child Congress December 2014. Developments at Regional and National Levels By: Isabelle Granger, IDRL Coordinator for the Americas, International Disasters Response Laws, Rules and. 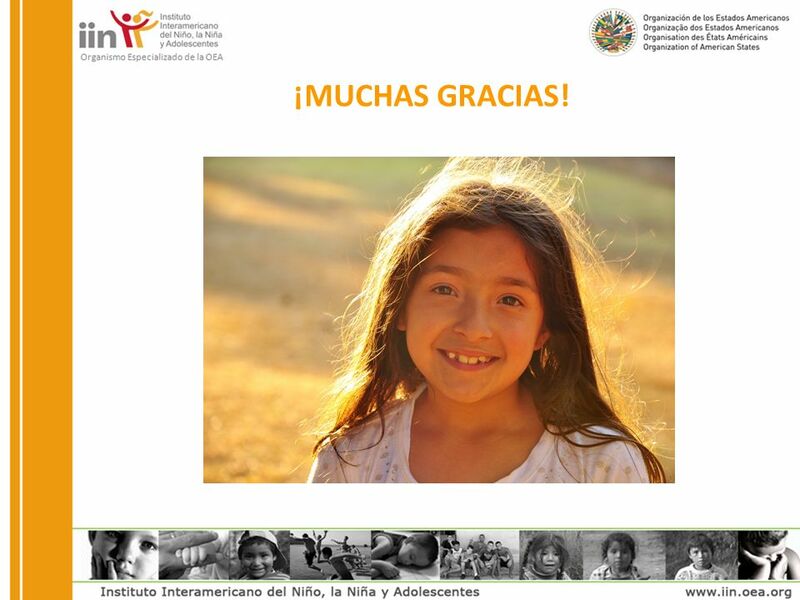 Annual Report to the 44 th General Assembly of the OAS INTER-AMERICAN CHILDREN’S INSTITUTE, SPECIALIZED ORGANIZATION.